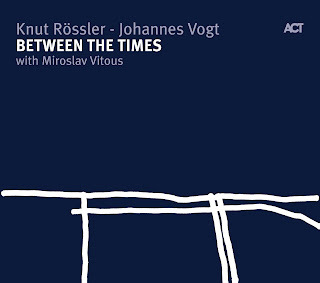 Saxophonist Knut Rössler and lutenist Johannes Vogt, having different musical perspectives and experiences, collaborated for a very extraordinary album “Between The Times”, which is released in 2007. When I started to listen to that album I have said that “wow, this is really an improvisation on baroque”. Although the title is about baroque and what I feel is the baroque music, on reading the booklet I have learned that the compositions that inspired the musicians are around 1650, which is just between renaissance and baroque music period. I have also learned lately, that there is inherently improvisation in the baroque music. 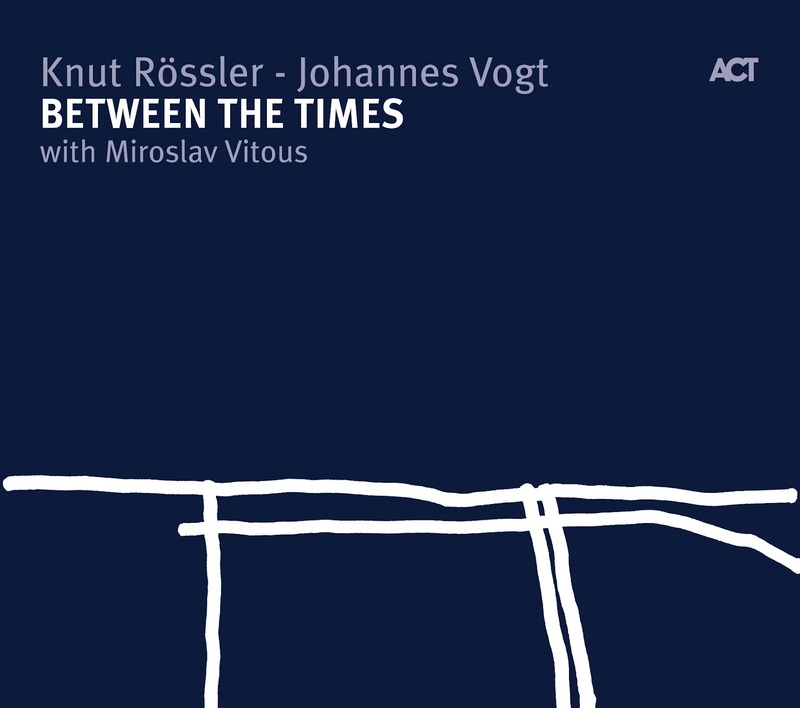 We see the incredible Miroslav Vitous’ name as the bassist and Mani Neumeier’s as the percussionist. Miroslav Vitous, is one of the most important bassist in jazz scene. He founded Weather Report and played with Miles Davis. He is among the melodic bassists and as a result he is literally a soloist. Generally speaking, what I feel is that saxophone is the jazzy part of the album, whereas the lute is the baroque side. The percussion and especially bass (very melodic and full of string-pulling sounds) are in harmony with the concept. Miroslav Vitous’ bass record in this album should be given attention. It is very deep and sophisticated. On the last line of the booklet, there is a note for hi-fi listeners to set their bass levels to neutral. I am really obssesive about musical knowledge and when I see this much detailed information about the albums I have listened, I feel like I have found a treasure. The above explanation is meaningful considering that the composers chosen for the album, are from a transition period, a transition from rennaissance to baroque. The original composers on the album are: Ennemond Gaultier (ca. 1575 – 1651), Denis Gaultier (ca. 1600 – 1672) – Ennemond’s cousin, Pierre Dubut (17th century) and his two sons (these three are usually not distinguished in the old manuscripts) and Jacques Gallot (ca. 1625 – 1690) – a student of Ennemond Gaultier. Vogt prefers to define paraphrasing rather than improvising what they do in this album but also accepts that they, in a way, are using a modal improvisation during paraphrasing. My comment: A very lyrical saxophone, carrying the melody, is accompanied by a very rigid and deep bass in the entrance. Some soft lute tones are enlivening the melody meanwhile. After the first minute, we hear a kind of duet in which bass is dominant and having the main theme of the song. Afterwards, the lute solo, with its pure melody, takes us to baroque period. When the lute solo ends, we see four musicians together improvising the composition. Then, at last, the most sensational part came with a lyrical lute and a very extraordinarily played bass by Vitous (really deep). Vogt’s notes about the piece: A free prelude with no audible bar-lines -"non mesuré", and a dialogue between lute and saxophone are set against a rhythmically distinct improvisation over a bass ostinato that dissolves into a free dialogue between saxophone and bass towards the end. My Comment: Lute enters the song by a solo, reminding us the authentic baroque music. After the first minute we hear Rössler’s velvety saxophone. Percussionist Mani Neumeier takes action after the first half with an almost oriental rhythm. Entrance of saxophone woke me up from my dreams. Saxophone and bass are sometimes talking with each other. Vogt’s notes about the piece: The Marquise de Montespan was "la maîtresse royale en titre", the official mistress of Louis XIV. "Kuna" is, according to some linguists, a word used 30.000 (!) years ago for "woman". Parts of the harmonic structure of Gallot’s pleasing piece are the basis for an improvisation, which intensifies, and then eases off again. My Comment: Another authentic lute entrance recorded with full of breath, scattered in the listening room. I have felt something fragile in my heart at first before learning the title when I hear the melody from the saxophone and did not surprised when I have learned that it is about woman. The percussion and bass performance of this album is awesome and may be one of the best record in my hand. This album and especially this piece is like a lesson to the recording engineers. The spirit is recreated in the record. Vogt’s notes about the piece: A short saxophone introduction followed by the original - played with a lecturing diction. The melody emerges out of a continuous arpeggio-movement (similar to that in Couperin’s famous cembalo piece "Les baricades mistérieuses"). The arpeggio figures evolve into a new piece for lute, over which the saxophone improvises. My Comment: A melodic saxophone solo is followed by a well-known lute partition. The saxophone is, a kind of, paraphrasing the main theme accompanied by percussion from time to time. 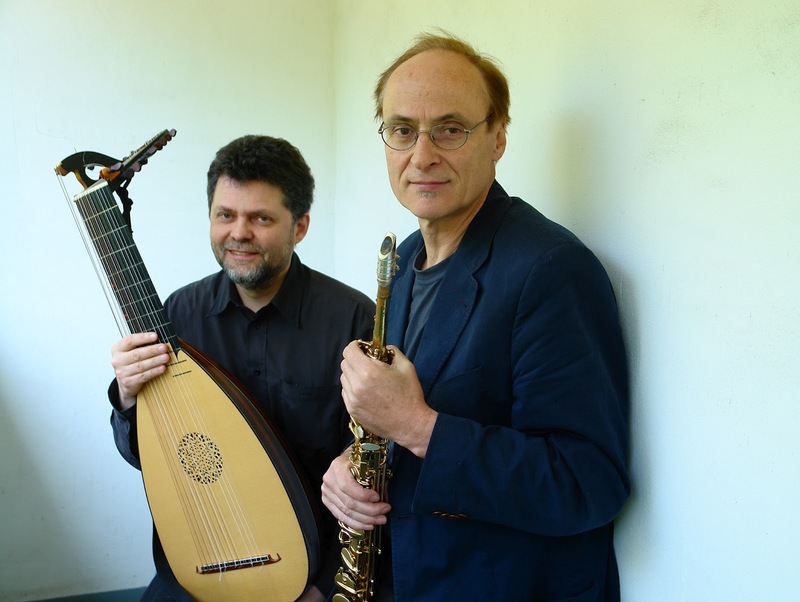 Vogt’s notes about the piece: Lute and bass state each of the six sections of the original, which receive improvised responses from saxophone and bass. After a tranquil interlude, the group takes up some of the harmonies of Gallot’s theme. My Comment: In the entrance, lute and bass give the main theme and saxophone takes action for improvisation. The Vitous’ solo near the end is wonderful. Vogt’s notes about the piece: Improvised saxophone/bass duets frame the regal lute-piece by one of Dubut’s sons. My Comment: A saxophone & bass entrance is followed by a long lute solo part, making us feel again the baroque deeply. Vogt’s notes about the piece: Lute sounds and saxophone improvisation. A lucid dream in which the players are aware of both the dream and the actual chaconne which follows, its harmonies casting their shadows forward. My Comment: An emotional melody is introduced by saxophone accompanied by the lute(sounds really like an acoustic guitar in this song) without bass or percussion. Then we listened the melody in an improvised manner from the lute before the end. Vogt’s notes about the piece:The dark and melancholy mood of the lute piece increases even more during the saxophone improvisation over an off-kilter ostinato in seven. My Comment: A really dark and melancholic song, which seems to be explaining the misery of humanity, at least I have felt like that. Vogt’s notes about the piece: In this piece, an eruption of rhythm leads to meditative introspection. Some of the notes of the accompanying lute figures surprisingly stem from Dubut’s sarabande. My Comment: Rössler’s alto flute gives a mysterious feeling to the piece, which is accompanied by the lute and percussion. Then solo lute part gives us the main theme. The entrance is repeated by the alto flute and percussion. Then suddenly everything is changed by the rigid rhythm of the percussion. I really liked the flute tone very much. Vitous bass’ is playing from the deep frequencies again. It is great to hear breathe-in sounds of Rössler during his improvisations. Vogt’s notes about the piece: A "tombeau" is a musical memorial dedicated to a deceased person. Melodic elements of Gaultier’s tombeau also appear in our new piece - the theme of which is change (on a metaphorical and on an actual musical level) and transience. My Comment: The entrance is made by solo lute. This piece has also a melancholic melody but also carries some hope. Then the bass takes action with the sythesizer of Vogt, which is well defined at the background. Then the saxophone plays the main theme while sometimes talking with, sometimes accompanied by the bass. Vogt’s notes about the piece: "Canaries" are pieces that apparently relate to a dance from the Canary Isles. Two rhythmic concepts meet in this final piece: The concept of playing with syncopation on the basis of a steady beat and (in the lute original) a flexible tempo that follows the wavelike motion of the melody. My Comment: The last piece is very melodic and rhythmic, in a way a little detached from rest of the melancholic album. However, the rage is controlled without crossing the borders of the concept. What we listen is a dignified celebration of the album in the last song. Listen Miroslav Vitous carefully in this piece, he gives us a great performance here. A last note: there exists another album of the same musicians in the same name with an addition: "Octagon", released in 2010.